The Med Diet reﬂects a way of eating that is traditional in countries surrounding the Mediterranean, but you don’t need to travel any further than your local supermarket to discover its delicious ﬂavors and fresh foods. It’s easy to bring the remarkable health beneﬁts and aﬀordable Med style of eating to your kitchen and we will show you how! Check out our Welcome to the Mediterranean Diet brochure. 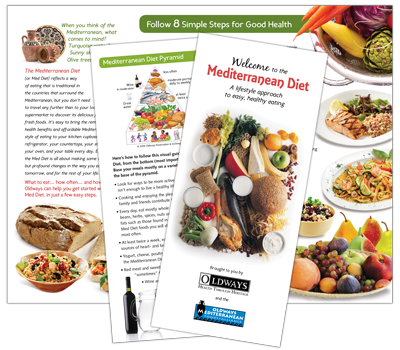 This trifold brochure provides 8 simple steps to get you started eating the Med Way!